Blue Eyed Mist was born on April 25th, 2009. She is a stunning Cremello Filly! She is shown above in November 2009 at her AWR inspection.. She is registered with AWR and is eligible for RPSI. Her dam Marigold is 16.3 hands and her sire is 16 hands. We expect Misty will make atleast 16 hands. She is an excellent prospect for any discipline and a exceptional broodmare prospect. As a broodmare she would produce Palomino offspring 100% of the time when bred to a chestnut stallion or 50% palomino/ 50% chance of buckskin offspring when bred to a bay stallion. She has a wonderful loving and curious personality, she loves when we go visit her in the field and comes trotting right up to play. 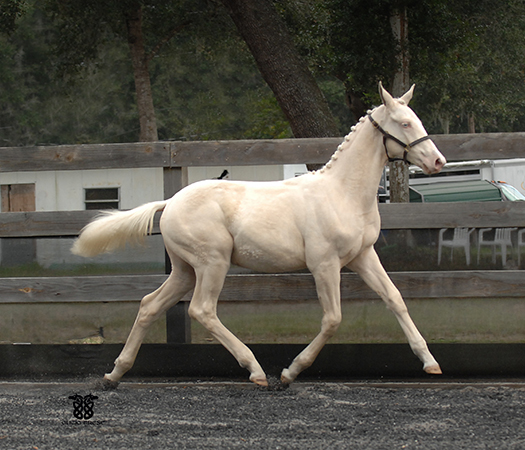 She has beautiful uphill conformation and as her gaits start to show they will no doubt be as athletic and graceful as her sires.Don't miss a opportunity to own a rare cremello mare with excellent bloodlines, movement and tempermant! Awarded First Premium at her AWR inspection!